Today's couple wants a master bedroom that they both love and wanted to do it for as little money as possible. A small budget can seem so hard at first but once you get into it they are so much fun. Especially after all the extra hard work has paid off in the end. Masculine yes. Feminine yes! And already husband approved. You gotta love that! You did awesome! I agree, masculine yet feminine! I love the navy chest! 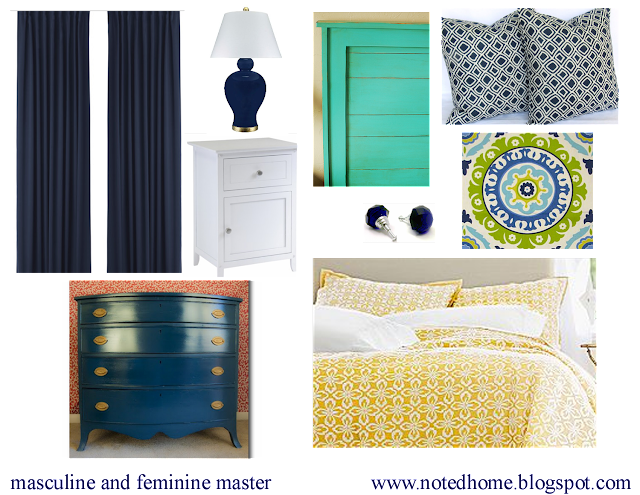 Always a classic and chic combo with a little nautical mixed in...great collection, loving that painted chest! You are a rock star. In case their was any confusion. LOVE THE DRESSER! Looks amazing! The dresser is divine!